Easy-To-Follow Instructions On How and When To Perform the Most Widely-Used t-Tests in Excel , Such As the Paired Two-Sample t-Test For Mean, One-Tailed t-Test, Two-Tailed t-Tests, Paired t-Tests, Two Sample t-Test Assuming Unequal Variance, two-Sample t-Test Assuming Equal Variance, and Welch's t-Test (Two Sample t-Test Assuming Unequal Sample Sizes and Variance). Hand Calculations of t Values and p Values Are Performed to Verify the Correctness of the Excel t-Test Functions. Lots of Screen Shots for Clarity. Thorough, Step-By-Step Instructions On How and When To Perform ANOVA (Analysis of Variance) Testing in Excel. All Three Types of ANOVA Available in Excel - Single-Factor ANOVA, Two-Factor ANOVA without Replication, and Two-Factor ANOVA With Replication - Are Covered Completely. Hand Calculations of Single-Factor ANOVA are Also Shown. Lots of Screen Shots For Clarity. Clear and Simple Instructions On How and When To Perform All Variations of Hypothesis Tests In Excel. Loaded With Solved Problems For Each Type of Hypothesis Test So You'll Understand Completely How Each Works and When Each Is Used. Learn How To Know When to Perform Hypothesis Tests of Mean or Proportion, One-Tailed or Two-Tailed Tests, One-Sample or Two Sample Tests, and Paired or Unpaired Tests. Learn the Four Steps That Can Be Used To Solve ALL Hypothesis Tests. Lots of Screen Shots for Clarity. "I purchased the Excel Statistical Master program to serve as an additional point of reference, to compliment my textbooks in my MBA Statistics class. The Excel Statistical Master program served that purpose. The step-by-step instructions and video demonstrations provided an easy-to-understand platform. I would encourage both students and professionals needing to perform data analysis to purchase the Excel Statistical Master program. The Excel Statistical Master program is a fantastic tool for anyone desiring to “make sense” of the data available to them." This is the best $40 I have ever spent." "I'm a medical student in Budapest and the Excel Statistical Master helped me so much with passing my midterms and my semifinal exam. There is no way I would have passed without it. "I am taking evening courses to get my degree in business administration at the University of Applied Sciences in Friedberg, Germany. During the day I am a sales manager in a production facility. For my bachelors thesis, I am performing a comprehensive statistical analysis of repair costs at the facility that I work. After searching for days on Google for the right framework to solve this problem, I finally found the solution. The Excel Statistical Master has allowed me to find exactly the right distributions and showed me how to create some excellent graphs. The explanations and videos in the manual are excellent, even for a non-native English speaker! "Mark, Thanks for your invaluable material. I have used it in my current business research methods for my bachelor students. It has enabled me to abandon SPSS for the first time! I have also given your link to the last MBA class I had. They told me that your book was of great help to understand my course!" "I really like the Excel Statistical Master. It is incredibly useful. The explanations and videos in the manual are excellent. It has really made my work with statistics a LOT easier. I'm really glad that I came across the manual. If you're a student of business statistics, this e-manual is worth WAY more it's priced. I will use your manual as a reference for my MBA course this summer." 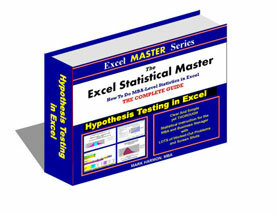 "I bought the Excel Statistical Master to help me in my statistics class. I must say, it was unbelievably useful. Not only did I master statistics in Excel, but the e-manual actually did a much better job of explaining statistics than my text book did. That e-manual made my statistics class much easier to understand, and I am now able to do all of that stuff in Excel, easily ! It is a GREAT book ! If you're a student or business manager wanting to learn statistics, this is easiest, fastest way to do it. "The Excel Statistical Master is being used for my MBA Thesis. I am using it to generate statistical analysis of my quantitative thesis study. It makes statistical calculation more meaningful. As I am working on my MBA thesis, I use it to generate statistics from the survey results that I collect. It is one tool no one can be without, especially students. I will also use it when I start my Business in Healthcare Statistics. "It is terrific that you offer this ebook; you are doing a tremendous service for people and I thank you for that. This is such a useful tool that you are providing. Statistics can be an intimidating subject and this is the only product out there that cuts through the complexities and gives a clear, easy to understand overview. If you offer other products in the future, please feel free to put me on your marketing list. It is refreshing to meet good people that are willing to share valuable information. "We just started building statistical Excel spreadsheets for our direct mail and online marketing campaigns, I purchased Excel Statistical Master to help fill in some of the blanks. Little did I know, this book has everything I could ever want to know about business statistics. Easy to follow and written so even a child could understand some of the most complex statistical theories. "The Excel Statistical Master is a real life saver in my forensic accounting practice. Until I found the package I was struggling with some of the "how to" aspects of statistics..no more. The videos are an extra bonus that really help! "Mark, I am quite impressed with the Excel Statistical Master. As a research practitioner, I’ve used the easy-to-understand document to help work through some pretty daunting data sets. As a professor of research, I will suggest the eManual as a supplement to my students. I think the strength of the eManual is the straightforward explanations of complex procedures in a software platform that is readily available. SPSS and SAS should shudder at the competition. "The Excel Statistical Master eManual is a wonderful product for anyone who needs to apply a variety of statistical tools and does not have the time or background to develop those tools themselves. 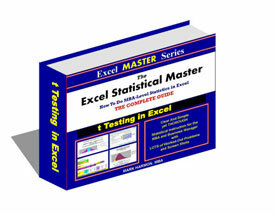 The Excel Statistical Master is easy to use, comprehensive, and powerful. Congratulations on an excellent product!" "Going through Excel Statistical Master has helped me in filling the gaps which most of the professional ignore while building models from scratch. 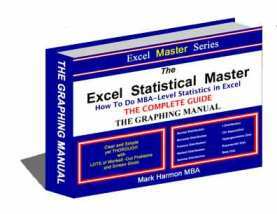 There are many books in market available in market but Excel Statistical Master explains everything in a simple way and how to use Excel to solve real life problems. Every topic in Excel Statistical Master is self explanatory and I would recommend freshmen as well as professionals to go through Excel Statistical Master. "My first encounter with the EXCEL Statistical Master came when writing a report for a customer when the axiom "an un-used tool becomes rusty" presented itself. I knew what analysis and presentation tool I wanted, but using EXCEL became cumbersome and frustrating. A quick on-line check revealed the EXCEL Statistical Master which proved to be unequivocal, easy to follow, and complete. Only after completing the report did I notice the description on the front page "Clear And Simple yet Thorough." Clearly, my experience supported substantiated this claim. Seldom does one encounter such truth in advertising. Last weekend the manual was very useful in helping my grandson, who just started a statistics class in high school, help understand, envision, and define his semester project as to which data to gather and how to analyze and present that data. 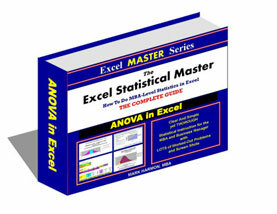 I have recommended the Excel Statistical Master to customers and my contractors." "I am an IT Consultant who gives a Data Analysis for Decision Making workshop to various private and public sector organizations. This workshop consists of many statistical methods. I often use the Excel Statistical Master in my workshop to demonstrate procedures, give usable examples and frequently, learn new procedures myself. I find it easy to use, clear and succinct. It should wipe out the fear of statistics from those who have a block against it." "I'm a PhD consultant in the area of "user experience". I help companies make their web sites user friendly. When I conduct a usability test on a web site design, I need to determine if one design is better than another. So I need to conduct a t-test. At other times, I conduct focus groups that help my client determine which of, say, 10 product designs is better than the others. So I need to conduct non-parametric ANOVAs on their rating responses. All this goes to say, I need to deal with data rapidly, and in a manner that I can send to my client. Does my client have any statistical software? No, they don't have SyStat or MiniTab or SPSS, or any other packaged stats program. However, my clients DO have Excel. With Excel, they can open my spreadsheet and see the data. While they are looking at the data (and perhaps running their own descriptive statistics like means, etc.) they can also see my statistical analysis I conducted with the Excel Statistical Master. They can see my charts, too. So, you can imagine the benefit this gives to my client. It's "one-stop shopping". Data, analysis, and charts all appear in one file. I like being able to send one file that works with Microsoft Office. My client has Microsoft Office. Now they have everything they wanted: stats, data, and charts." "Why Is the Excel Statistical Master Such a Great Learning Tool?" ►It's LOADED With Completed Problems ALL in Excel. ►All Solved Problems Are REAL-WORLD, BUSINESS Problems. ►More Than Half of the Lessons Are Supplemented With VIDEOS To Help You Understand Quicker . ►Lessons Are All in BITE-SIZE Chunks. ►The Statistics Are MBA-LEVEL . ►All Lessons Are In CLEAR, EASY-TO-FOLLOW FRAMEWORKS . ► NO USELESS THEORY Is Taught. ► NO PRIOR STATISTICAL KNOWLEDGE Is Needed. ►Every Lesson Is Entirely In Excel. NO LOOKING UP ON CHARTS . ►You Already Know Excel. NO NEW SOFTWARE NECESSARY . You Don't Need SPSS, SAS, Systat, or Minitab. ►Lots of Solved Problems Included With Each Distribution. All Problems Are Solved In Excel With Easy-To-Follow Instructions.